About a month ago I bought myself something rather quite special. I bought it from a fellow blindie who had had a change of health and although the bike had been serviced and well looked after; it had remained sat un-ridden. It is only through the ‘on this day’ feature of Facebook that I can tell you that it has been just under two years since I have ridden a bike. It was when we were away on holiday with the children, it was when we were riding on site of a Haven Holiday Park. After this I am sure that there was one further bike ride back at home before my bike was left to gather cobwebs and become home to spiders in the garage. I did not stop riding because of an injury. I stopped because with my hearing going in addition to my sight I did not feel I was safe either for myself or for other road users. Many would be surprised that it is only in the last two years that I haven’t ridden my bike. Thinking about it now, it was pure stubbornness that had stopped me from hanging up my riding helmet before then; in the same way I can only imagine that a car driver who is in denial about their sight feels about surrendering their driving license. A tandem was a way of gaining back some of me. Yes, by the very definition of it I would only be able to ride with someone else. But riding a tandem with someone else feels less of a lack of independence than riding a bicycle with another adult beside me. I think that this is because a tandem is for ANYONE. A normally sighted person can ride a tandem, it isn’t a ‘mobility aid’ in the conventional sense of the word. Even though when I think about it, in my case it kind of is just that; a mobility aid. I had the bike serviced and checked over. I spoke with a few friends about coming out for a ride with me and then, earlier this week. One of them took me up on my offer. So, if all I was to do was to peddle. When and how would I know to peddle? How would it feel sitting behind someone else (The Pilot-more jargon) who was in control of where we went? How fast we got there? And in what intensity of gears we were to achieve it? I guessed I would just have to ‘go with them’ … LITERALLY. 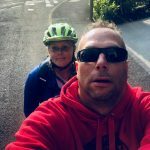 My faithful Climbing Partner in Crime (CPiC) Simon was my first volunteer; we have ridden together before (on individual bikes) and he more than most understands my sight loss, and more to the point my anxieties of something new. First he took the bike for a ride to the end of the car park without me. This gave him a feel for the length of the bike and the kind of turning circle it would have. Then it was my turn to get on with him. My first ‘odd’ feeling was that I had both my feet off the floor, on the peddles and yet the bike was still upright and stationary. This being because Simon is taller and still had his feet on the ground! We set off; it was wobbly, but it soon became smoother as we got into a rhythmic pattern. And surprisingly; not being able to see infront of me wasn’t concerning (because all I could see was the red of his jumper) felt O.K. I began to relax into the journey, I began to feel when it was time to coast and when it was time to peddle. I also felt the exact point where my shoulder relaxed and my anxieties of ‘letting the other rider down’ were disappearing. And before I knew it we were heading back towards home. I could lie and say my arse wasn’t hurting from being sat on a not so padded saddle. I could lie and say I didn’t get cramp in my thigh….. But then were would the fun be in that? It was interesting to discover that I can suffer with ‘Elvis Leg’ when riding a bike, just as I do at points when I am climbing….. This usually comes at a point where I am concentrating so hard that (as silly as this will sound) I forget to breathe! We managed to clock up just over 9km on our first ride. After all I live in The Highlands area, which as the name suggests is an area with many a hill; which for the most part I want to be avoiding until my bike fitness has improved somewhat. The route was recorded on my Apple Watch and all the specifics as to times, heart rate and distances are stored within my fitness app. So next time we can follow the same route and see the improvements in it. …. But as he never managed it, he said it was just something he would have to get used to. And he has agreed to go out and ride with me again. So watch this space for more tandem cycling antics. It can come from no where and just APPEAR before you even realise it is there, then it can stop you from achieving so much, holding you back from something that you don’t even realise is a SOMETHING. For me, I have a fear of falling. Literally falling, not metaphorically falling. Which you would think as a climber would be ‘part of the territory’ for me; and actually partly it is. However there is a big difference between taking a fall on a rope to taking a fall on a bouldering wall. The most obvious of which is the lack of rope! That rope that even when I am 17 ft up a wall doesn’t guarantee I won’t hurt myself on the wall; or swing out; or come down a fair distance because of the give in the rope, or my belayer leaving too much slack. And there are also times when I make a move on a roped climb and I am not actually at a height where the rope would have an affect. But it is a security, it is a safety net and one that even if it is purely psychological at times makes me feel safe. When I boulder (outside of competitions) there are no top ropes, no safety net. It is all on me…..
And that is scary and fearful and makes me emotional just writing this. One thing that I see other climbers doing, and I have watched dozens of instruction videos about, is jumping down from the wall. Not from the very top, but most definitely from a height at least as tall as they are. Which for me; as someone who cant even see the floor when I am stood on it, the thought of jumping any height is where my fear of falling comes from. You see, or rather I can’t see, so can’t work out where the floor is and how quickly I will approach it. And it is this fear of falling and not being able to get off of a climb that has stopped me from wanted to boulder. It is only on the odd route where I can actually ‘top out’ climbing over the top of the wall and coming back down via the cafe seating that I happily give it a go. As in the colour, not the food! Well, basically biscuit is v0, the easiest of all the climbs. But it wasn’t because of the ease of the climbs, tonight I had decided I was going to work on something in a different way. I was going to work on my fear. However it wasn’t about the climbing up, it was more about the coming down. And this is a point that anyone who climbs will tell you is actually harder than going up in the first place. So, how do you climb down? I often climb up by allowing my feet to follow where my hands have been, I didn’t know how I could just reverse this process seeing as I couldn’t actually see where my feet were. May sound silly, but thinking too much is often my downfall. It didn’t matter what holds I used to get down, I didn’t stick to biscuit, I just took the holds that felt safe and in reach. A reach that I naturally found myself doing with ease when I crouched down, climbing my hands down the wall first to enable me to then move my feet. As good as it felt not to be scared of going up as I knew how to get down, I was exhausting myself. But how do you jump when you can’t see the floor? So, to jump off the wall. This is where the trouble with thinking reared its head again! I just kept thinking about it. So much so that I had built it up to be a lot more than it actually was. With my CPiC spotting me (standing behind me) he put his hand on me to ‘show me’ where he stood against me (height wise) and knowing that he is just short of 6 ft I could gauge where I was compared to the floor. I had to climb down further. And even then I just couldn’t jump. As I said, I was thinking too much……. I knew the floor (safety matting) is spongy and have some give in it. So I knew I wouldn’t be landing on solid ground (for good reason too) but knowing that the floor would move made me even more scared of it. I needed to just do it. But how do I jump? I was holding onto the wall….. I forgot how to jump. So, letting go with my hands first and then i jumped……..
Only I didn’t …… Not really ……………………………………….. I forgot to bend my knees. I landed with a thud. It was purely because of my CPIC that I didn’t fall backwards. I went back to climbing off the wall………………………. I faced a fear, and although I didn’t over come it, I tried. I gained a better understanding of my position on the wall. I worked on my technique. I worked on my starting point on the wall. I worked on my start, pulling myself up from an almost sitting position on the wall and I focussed my energy on something else. The benefit of me doing it is that I couldn’t see how stupid I looked (I felt stupid enough) I bounced on the matting, I sometimes stayed on my feet and sometimes not. But each time I jumped I landed without hurting myself or anyone else. It may well have looked ridiculous; your probably reading this thinking it sounds ridiculous. But do you know something. That doesn’t matter. Because despite thinking, despite fear. I DID IT. Just as a car driver does not need to actually look at the gear stick to change gears in a car, there are places where I can move around with great ease without the need to see. To a degree I can walk around in my local gym without the need for my cane or guide dog. The machines all have their set place, it is just me needing to focus on where the other gym goers are, although given the location of the mirrors and the windows in the gym I can easily become disorientated. One such place I do not need to look is my own home. Although this does not include my childrens’ bedrooms ….. These are the only two places in my home that I walk with shuffled feet and taking extra care. But then I have it on good authority that many of my sighted parents do the very same thing in their childrens bedrooms as they are a minefield of Lego, cars, clothes and all things child! I can also extend this ease of movement to The Scout Hut where I volunteer, although with this environment I have to factor in moving children. However the main hall, entrance hall and kitchen are set out in such a way that apart from the odd additional table, everything has its place. Suprisingly another place that I can move with ease is Calshot Climbing Centre. For obvious reasons the walls never move. Even though the holds and routes on the walls may alter. The blue fencing around the climbing walls and the black cubbyhole benches don’t move. It is just the climbers, their gear and the ropes that do. The wall also has marked out areas on the floor where you can and cant walk. 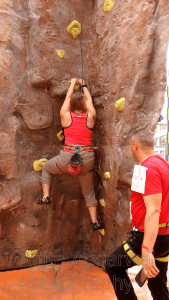 These are depicted by a dark red floor for the climbers and belayers to stand in and a black mat flooring where you can wait, stand and walk without being in the way of a climber or their belay partners. Although saying this, there is not much contrast between the two colours and if I don’t concentrate I can occasionally get it wrong. But generally I am ok. Although if I am moving between different climbs; for ease I will link into the arm of my CPiC. Is there a clear path? I know to walk with my head down, so that I can look out for objects on the floor. I also find myself asking others if they are belaying if there is the odd person stood. 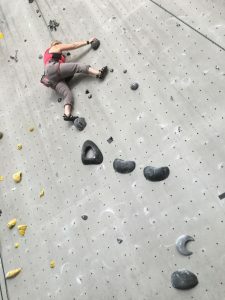 Because although I can see the person, I would really struggle to see the rope they were holding on to and as a considerate climber, I would never want to walk near a belayer that may need to suddenly move to support their climber. This familiarity that is great for me is often an issue of concern for those who do not know me. Especially as I tend to wear a top that says ‘Blindclimber’ on the back. I have previously, in other circumstances had people question my blindness. It is a common occurrence and one that does not faze me. It does however occasionally upset me when people are critical and rude in the way they question. Well, Friday while climbing I had one such occurance. The climbing wall was cold. So while belaying I had my fleece on. This covered my top. So as is usual, I don’t look up to watch my partner climb. Not because I am rude, but because once his feet are over my head height I can’t see very much of him. And because I feel is climbing and movements through the rope; I learnt a long time I didn’t have to get neck ache and pretend. Oh my God, he isn’t safe up there. How can he be safe with her? She isn’t even watching him! Wow, he’s brave. How can someone belay without looking out for the guy on the rope? This is a conversation I have had many a time with my CPiC, he knows I have him. He knows he is safe. He would not be happy to climb if he didn’t feel either of them. Hey, just so you guys are aware, I can’t see too well, so if you are climbing near here you will need to be more aware of where my partner is as I can’t warn him of where you may be on the wall. But it enabled me to make my point and be heard loud and clear. So, it was my time to climb and off came the fleece. The back of my top visable and I never thought anything more of it. She can’t really be blind, look she is walking with such confidence she can clearly see what she is doing. Why would you lie? I don’t even warrant such comments with an answer. I just got my water and went back to my partner. He instantly realised I was bothered by something and so I told him, he knows how this gets to me and told me (sincerely) to ignore them and enjoy the climb. And exactly what I will continue to do each and every time someone questions my abilities. Afterall, those who are technically blind can often see something. And they will use that minimal sight to appear as ‘normal’ as the next person. I don’t believe I am any different to others in that way? Or maybe I am? Why don’t you put your comments below. I am always interested in people views. 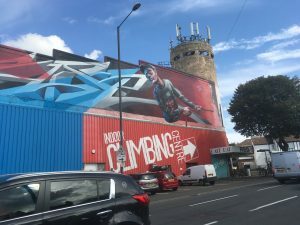 And so it all starts again…..
EICA – Edinburgh International Climbing Arena, hosted by BMC and MSC. One year and one week to the day of my first ever competition and I was back to do it all over again. And in that one year and one week many things had changed. 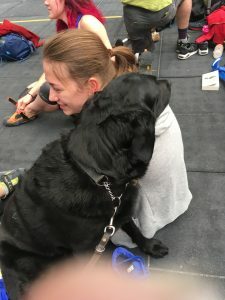 I have most definitely changed; my climbing has most certainly improved and although my sight and hearing have had their setbacks (as detailed standing alone) I thought I was in a much stronger position physically and mentally for this competition. I wasn’t sure though, why I hadn’t been as prepared for the 13 hour drive that had seen us be diverted off the M6 and not arrive at the hotel until after 1am on Saturday morning. After all, thanks to said sight and hearing impairments, I wasn’t able to share the drive with my CPC (Climbing Partner in Crime). The whole horrible job had been left to him to endure and in turn exhaust him mentally in ways, that as having never been a driver I can’t quite understand; yet one I can fully empathise with. This year was different, this year I didn’t have the apprehension of a new Climbing Centre, the apprehension of never having competed before. This year I had a bench mark; a place to beat and a score to improve upon. 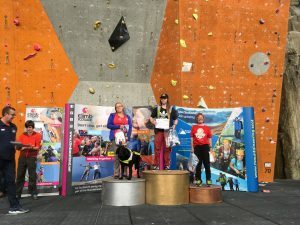 This year I always wanted to EARN my podium place (not just get it by default-having been the only competitor last year!) Which although I couldn’t guarantee I wouldn’t have competition I was setting myself a personal goal to get me up on the podium. After a bit of a wobble I found myself ready to set about the day. My first move was a bouldering problem which was actually marked as the hardest of my 3 problems, but it wasn’t something I was aware at the time. it was to start from a sitting position, it was also then I realised that my routes where only to cover 2 categories; interestingly the 2 categories where VI and Upper-Body Amptutee. It happens some times that some routes are set for particular categories and not others, for example a route set for lower body amputees would probably not be suited to an upper body amputee. And for a reason I do not understand it is often that the Vi and Upper-amputee are grouped together. 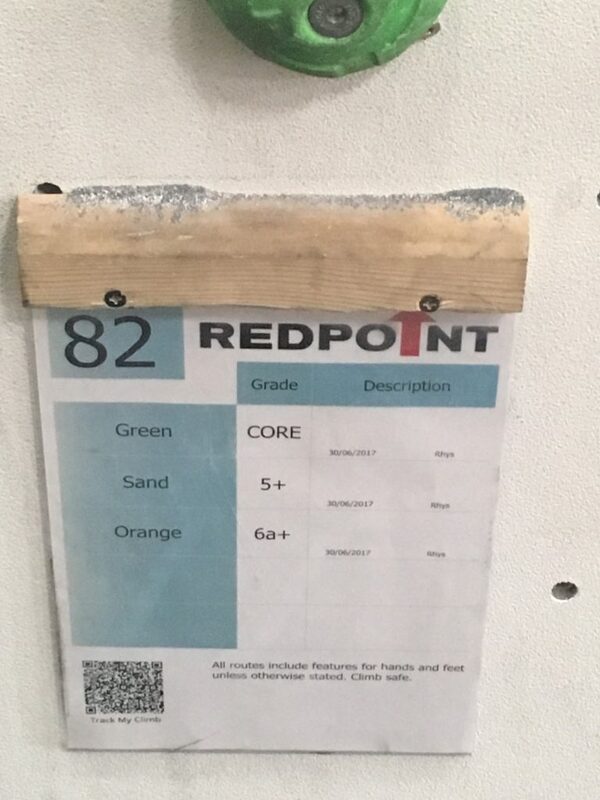 All competitors (from each of the 9 categories) had the same Boulder 1 and 2, in addition to Climb 1 and 2, but when it came to the 3rd of each problem this was where the VIs and Upper body amputees had a different problem on each. This meant that the queue of competitions on these routes were much smaller; hence my school girl error of actually doing my hardest first. So, going backwards I then completed with a flash (getting to the top on 1st attempt) Boulder 1. I wasn’t as successful on Boulder 2, where I misread my footings and started off all wrong, a silly error I repeated on my following attempts. Time for lunch and freshness break for Guiding girl Fizz, who had made herself lots of friends while benched as I climbed. And was sporting a slightly grey colour around her ears; afyerall a black dog around all that chalk isn’t the best mix! Then it was onto the climbs. (Which unlike the Boulder, you only get one shot) Climb 1 was over before I realised, it was a great warm up climb and one I didn’t need any guidance from the ground on. So, off I went and got myself tied in for the climb. I was about 2 m off the ground when I realised I didn’t have the support. My ground support wasn’t there, I was on the climb alone and had to up my game and concentrate on my hands and feet. I heard no instruction, I just had to focus and more importantly; remember to breath !! ….. Something is very easy to forget when I climb…..
Thankfully coming down I confirmed with the judge, I had got to the final hold and I had flashed the climb. It was then I discovered my CPiC’s injury and worked with him to support his injury to enable him to finish his own last two climbs. It also gave me the opportunity to watch my CPiC complete his climbs too. Then it was time for my final climb; just in time too as they announced it was time for the last climbs. And this climb looked like a great contrast; black holds on a light grey wall. I hadn’t worked out why my fellow climbers had ignored several of the obvious holds, that was until I got on the wall. The ‘obvious’ holds were in fact not holds at all, they were black gaffer tape taping over quickdraws and other such climbing accessories. A feature that had apparently been on the other walls too. But as the holds on those routes weren’t black, I hadn’t even noticed them. I took on the climb, it was most certainly a challenge. But a fun challenge at that. I had a move planned in my head, I moved my feet to make it an easier set a ste and then ….. OUCH! It was the final climb though, I had no second chance and one I am proud to say that “I climbed until I fell.” Not something I had done in previous competition; not something I had been doing while climbing in general until very recently. And yes, I fell….. But it felt AMAZING !! I climbed until I couldn’t climb anymore. And it got me a Silver Medal! Out of the 4 competitors in my category I came second. A medal I am more than proud of. And can’t wait to improve on at October’s competition! Roll on round 2, when I get to climb at The Castle !! Ratho is ingrained on my memory; it is where it all began; it is a place that until this weekend I had only ever been once before. But my memories of it didn’t disappoint me. Although, sadly my sight and hearing did. What is so special about Ratho I hear you ask? Ratho is the home to EICA or Edinburgh International Climbing Arena. It is where my journey REALLY began with my climbing. The date was 3rd September, 2016. Yes I did say 2016! However, it would take until 9th September 2017 to really realise it. You see, this is the date that I made my second visit. The visit that was filled with mixed emotions, anxieties and fears. But for very different reasons. And it is because of this that this visit where I felt much more so than ever before that I was alone. 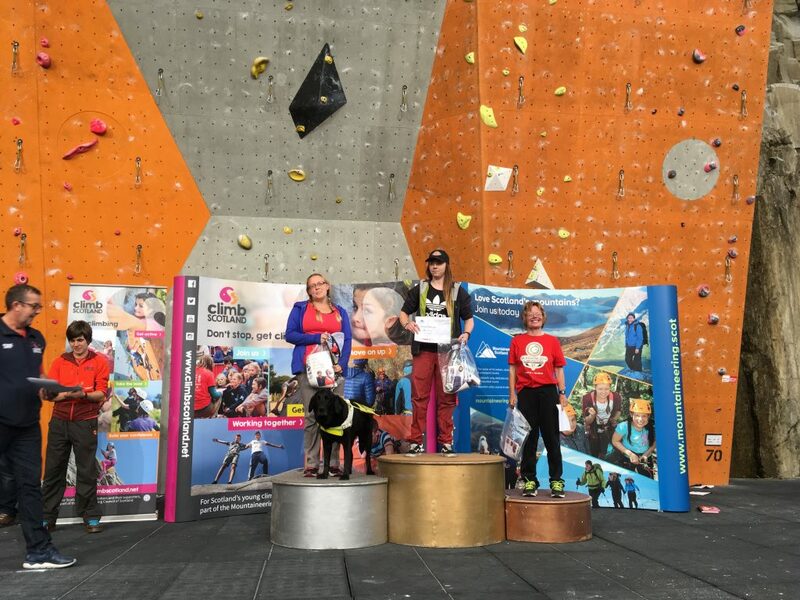 Obviously I wasn’t literally alone; I was surrounded by 43 other paraclimbers, who included my best friend and CPC (Climbing Partner in Crime) in addition to about 400 other climbers, spectators, Scottish Mountainering and BMC staff. But still I felt alone. 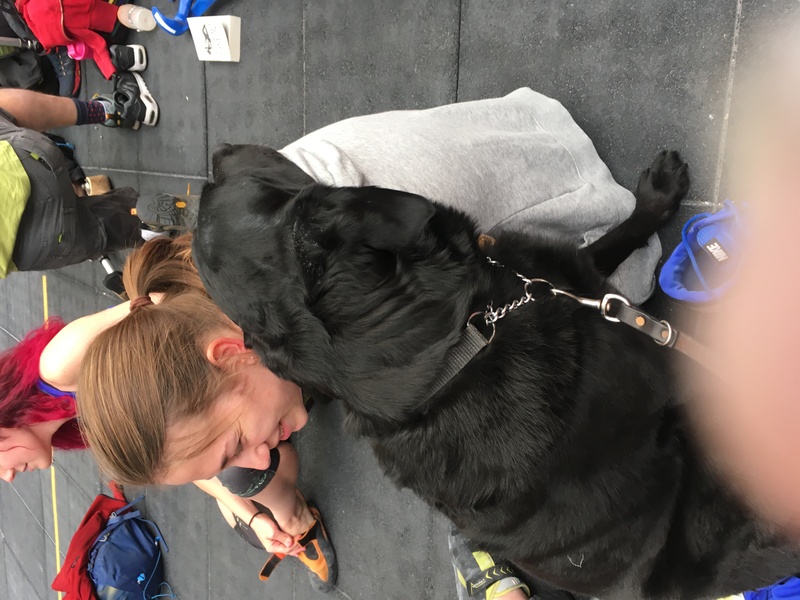 Wizz back to that date in 2016 and I found myself at my very first Climbing Competition; totally ill-prepared and in a much poorer condition to that of the climbers all around me. But I had a rucksack full of nerves and a naive mindset that I wasn’t troubled by it. Again my CPC was there, he having not signed up to compete, he who subsequently volunteered to be a belay and judge for one of the climbs. Leaving me to face this adventure alone. Although it wasn’t until Saturday I realised just how much I had taken that to heart and how much I needed to summon up the same courage I had had the previous year. This year I KNEW Ratho would be different. Not physically (although yes the climbs would be set differently) but for me, One year later I now wear hearing aids, my sight has detereated even further and my physical and mental strength had changed. 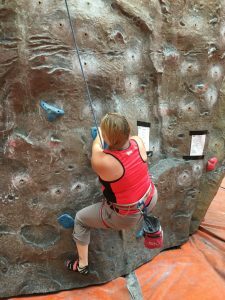 The changes in my physical strength and my climbing capabilities are most definitely a positive and I couldn’t wait to push myself on the climbs. However with my sight and hearing changes, my mental state was in a questionable way. It was such a way that I couldn’t face explaining or mentioning it to my CPC, Ratho this year held its own challenges for him, he didn’t need to deal with my Sh*t too! You see, last year he started the competition at Round 2. So, although he had been to EICA before, he had never climbed or competed. This year is also the start of the competing calender for his son. Who has NEVER competed before and although he loves to climb has a great fear of heights. My CPC needed to be their for himself and his son. Not me. After all, I am a grown woman, I didn’t ‘physically’ need him there to partner me, as the belayers where also judges for the competition. But for the first time in a very long time I found myself surrounded by familiar faces, yet standing alone. This was my demon on Saturday, not the fault of anyone else, most certainly not my CPC’s, my other friends or even fellow competitors. It wasn’t even my ‘fault’ it was just a demon that was with me. And one I was desperate to ditch before the competition began. One ‘thing’ I have noticed is that I often only see (yes I know how ironic that sounds) the changes in my sight when I return to something or somewhere that I have been before, but not for some time. On a day-to-day I don’t ‘notice’ the changes. It is when I go somewhere or go to do something I haven’t done in some time that I notice it. The main reason for this is and ‘perks’ to my sight is because the deteriation occurs ever so slightly, and the sight that I have left is so minimal that no change is ever obvious. It is for this reason I have yet to return to my university town of Nottingham (that’s a whole other story though, for another time). I dread being able to detect the changes. And if I am honest, I really didn’t think that in ONE YEAR Ratho could be so different. I had forgotten that although I was under the care of the audiology team, I was unaware of the exact change to my hearing. I most certainly was not aware that I would be needing hearing aids. So, it is no wonder that by changing the ‘sound’ of the venue, I inturn realised how this visually changed the whole venue too; before even adding in the confirmed deteriation I had been told of at last weeks eye clinic appointment!!! I took myself away, I left my CPC and fellow competitors. I (guided by Fizz) escaped to the tranquility and safety of the gardens of Ratho. 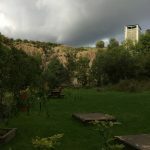 Being built within a quarry you end up entering the building at the top and walk down into it, meaning that the garden is almost level with the main climbing floor. There was the odd person about, but more importantly there was silence. There was birdsong, which I didn’t remember from last year. And there were great big slabs of rock to sit on. And sit on the rock I did. I sat and I cried. I sat and I felt myself falling apart. I sat and I reminded myself to breathe; to control my demon and just allow the emotion to wash over me, yet not allow it to control me. I sat for far too long, I missed the start of the comp, I missed the group photo, but I was also able to leave the emotions that had gradually been bubbling under the surface behind in the garden. I was able to let them wash over me, but not control me. I sat and I focused. Sod not being able to see the faces of my friends. Sod not being able to see the walls as clearly. So I took a deep breath and returned, plastered on a smile and ‘acted’ the confident climber; I ‘acted’ the inspirational climber with the shear stubborn nature that others had previously commented on. What’s 3 hours travelling between friends? 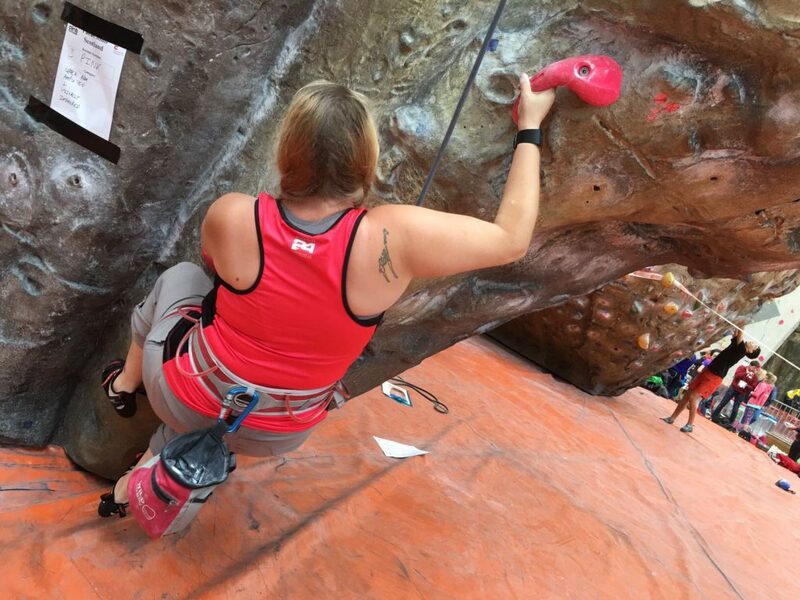 Although I have been climbing for a few years now, I would say that it is only since I discovered how poor my performance was in last years Para climbing BMC Competitions were that I have really been working on upping my game. So, when a friend and fellow blind climber shared on Facebook the BIC Festival (Bristol Inclusive Climbing) I found my interest spiked. Checked the calender…. It was clear. My climbing partner in crime was away with a Cub Scout group. And being over a month away, the train fare was less than £15 return. With all those ducks in a row, there was just on thing for it….. I was going to Bristol. Fastforward the month (to Friday 1st September) and it was time to set the alarm. My bag was packed for the day, my tickets were printed and I had apt reading for the journey. Just under 3 hours later, the announcement on ithe train said ‘We are now approaching Bristol Temple Meads” and just in time as Miss Fizz was beginning to become unsettled. I had a 1:1 session booked in as part of the festival in the afternoon, so for now with Fizz by my side we were off to explore Bristol. Being a place we have never explored before, with the sun shining there was no time like the present. Along with Google maps and a need for a Starbucks, we set off. We walked along the canal, we walked amongst the many building projects and we found our way around the busy roads and numerous complicated crossing to get to ‘the shopping district’. Where my faithful guide sort out and found said required Starbucks. The sun was shining and I soon discovered that it was not just the centre of Bristol that had busy roads and complicated crossing … Espeially for a blind girl and her guide dog! But again, the kindness of strangers found us being walked across the road and traffic stopped by a kind hearted delivery driver that was partly the cause of the terrible crossing conditions as he was parked up ready to make a delivery. We made it safely across and into Redpoint, where Fizz instantly recognised a friend. The wife of the fellow climber who had originally shared the BIC information on Facebook. He, John as a VI climber was sat in the midst of the festival chatting to visitors and participants about the para-climbing community and the bmc team, which he is part of. The staff at Redpoint had clearly undertaken disability awareness training and were very helpful, yet not in a patronising way. I was guided by a friendly guy who was explaining the changes in floor textures, the areas we were walking through and finally the festival sign in area before handing me over to his colleague to chat with me in more detail. So, freshened up and kitted up I left Fizz ‘benced’ to a tale where she was able to play with both John’s working guide dog and retired guide dog while I went and enjoyed a 1:1 session with an instruction called Tom. What would you like me to challenge you on today? So, we had a bit of fun, I tried a bridge problem, where for the most part my feet climbed up the walls to the left and right of me, with the odd quick foot touch on the wall in front. Would I be a Climber if I could see? It’s a simple question; but honestly not one I can answer. Simply put, it doesn’t matter about ‘can I?’ ‘Would I?’ or even ‘Should I?’ Because I can’t see and I can climb. My sight & hearing loss has made me who is here today, it’s not about what I can’t do. it should ALWAYS about what I CAN DO. Yes I like most have wishes and hopes of things I want to do; but as yet haven’t. I am also human and long for the day that I can see and I can watch my children playing on the other side of the park. But, I am a realist and know that there are some hopes and dreams I will never have come true. But life is for living, something that I can’t do if I sit too long and dwell. Theresa Osborne-Bell | No comments | Tags: blind Climber, Para-Athletics, VI Climber, would I?